Some anime series are so old they are new again. 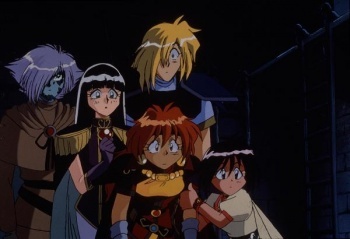 The first season of Slayers, aptly titled The Slayers, first popped into retail shelves on VHS tapes during the late 90s when commercially available anime was limited. Now in the 21st century, a new generation of anime fans can visit the classic series on shinier and cheaper DVDs while veteran fans can revisit The Slayers and reminisce that "boy, they don't make anime like this any more!" Set in a fantasy Dungeons & Dragons or World of Warcraft setting, The Slayers introduces viewers to a colorful world full of swordsmen, magic users and cannon fodder enemies. Each main character is a caricature of stock fantasy role-playing-games hero classes. Starring the powerful and short-tempered sorceress Lina Inverse and assisted by the skilled yet dimwitted swordsman Gourry, the gullible justice freak Amelia, and the stoic chimera Zelgadis, the quartet roam the land slaying bandits, exploiting any situation for their financial benefit, occasionally saving the world from an evil presence, and drumming up laughs no matter what the situation is. Yes, comedy is the focus of The Slayers and everything is fair game. When the characters are not poking fun at each other's faults, the series throws bizarre situations, scathing commentary, and parodies of other anime. The Slayers does not take itself seriously as pretty much every episode is filled with gags and jokes. Even during an intensive climatic episode near the finale, they will toss in a comic relief character just to snap the show back into comedy. The characters even remind themselves about the tone of the show when the comic relief arrives unexpectedly. When they are not aiming for laughs, the fantasy setting of The Slayers is an excellent venue to show off its imagination. The plethora of monster designs range from standard fare, formidable creatures, and comically stupid. Each magic-using character employs a range of spells in their repertoire from simple flare arrows to the elaborate Dragon Slave that hits like an atomic bomb. Sprinkled throughout the series is a backstory explaining the magic, magical treasures, and epic historical battles between godlike monsters that fleshes out the setting like a simplified Tolkien fantasy novel. Sound plays an integral part in The Slayers. The music conveys the mood well as it switches from pleasant expository to low pitched ominous tune during tense dramatic scenes and to whimsical during the many comedic moments. The voice acting has a lot going for it in either language. The original Japanese dialogue sounds better as it features the smooth Hikaru Midorikawa as Zelgadis and the iconic Megumi Hayashibara as Lina Inverse. The English dub has better jokes and a cast that sounds awfully familiar since it features most of the voice actors who starred in the original Pokemon series (back when there were only 150 Pokemon.) It is a tough choice choosing a preference in the language track, but at least the DVD offers both compared to those ancient days when VHS tapes only had one language track. Because The Slayers is a comedy series, each gag-filled episode leaves little room for a connecting plot throughout the series and the progression of the series is its weakest point. The first half of the series pits Lina, Gourry, and Zelgadis against a powerful figure who unleashes an evil godlike monster set on killing them. After the monster's defeat, the series seemed to have no idea what else to do. After introducing Amelia in the second half, the season ends with a climatic battle against a copy of the powerful figure from the first half-he is even referred to as a copy-who unleashes another evil godlike monster set on killing the heroic quartet. It begs to ask where the plot of future Slayers seasons can go. While lacking deep plots, realistic settings, or the detailed CG animation, the sheer amount of humor gives The Slayers its nostalgic appeal of a simpler time when anime focused on entertaining its audiences. The jokes are rapidly delivered and executed well and are sure to give the viewer several memorable lines or scenes to chuckle at later. But probably the biggest thing to remember from The Slayers is that any comments regarding the figure of a short-statured, short-tempered woman will result in lots of physical pain. Bottom Line: The variety of characters, imaginative fantasy setting, and never ending comedy makes up for the barely-present plot of The Slayers. Recommendation: The Slayers is great for a brainless comedy and a reflection into the nostalgic old school anime. Fans of more serious anime may not enjoy it so much. Tom Tonthat keeps a single VHS tape of The Slayers autographed by the primary English cast that he won during an anime convention for nostalgia.